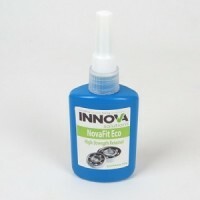 NovaFit Eco – High Strength Retainer is produced from our latest non-hazardous technology incorporating a bespoke group of high purity raw materials. This unique future-proof technology ensures that the product label requires no hazard symbols or risk and safety phrases, and enables the product to comply with even the most stringent health and safety requirements. It is a high strength medium viscosity retaining compound, designed to bond close fitting metal surfaces with an ultimate structural strength. Especially suited to bonding cylindrical fitting parts, whilst maintaining an unfaltering bond under all levels of cyclic load stress distribution.